I finished this one today, fabrics by Island Batiks, I just did a basic swirl any which a way. I found another quilt that just needs the borders quilted...so hopefully I can finish that tonight! FINISHES!!! Trying to Stay focused! Yesterday I sandwiched three quilts and have two already sandwiched and so that is my goal to get them quilted. I just love these Gesha girls. I got the design from Designs by Juju...I just love their embroidery and it works up really well. It is so fun to have some finishes and it feels great.... Unfortunately there are more but I am determined to get these done and then go on to the tops that are half finished and work on those. This one quilt below is made from Fabrics from Inchworm Fabrics as well as the Oriental fabric above. Trying to stay focused! How do you stay on the path? I TRIED TO BE STRONG!! This is one of my favorite patterns. I put batting behind the turtles and blanket stitched around them and then cut the batting away. I can't wait to actually quilt this and see if the desired effect I want happens. I JUST CAN'T TAKE IT ANY MORE!!! I don't know about your sewing room or how you feel about things but.............. I have so many projects just laying around the sewing room waiting to be finished. It drives me crazy....so I decided to get busy and get some things done. Here is one of my finishes. I have found since I use glue to help me with the bindings that my borders way but as soon as it washes it goes flat. I think I use too much and the wave is the stiff part and can't help but wavy. Great project for practicing my FMQ. AND it is DONE!!!! One pile gone. This is a panel and you can find it and the coordinating fabrics at Inchworm Fabrics. Then I had a friend showed me a picture of a quilt that she wanted to make for her baby and asked if I thought she could do it??? Then she said she had plans for her sons but never got around to it. I told her if she wanted she could send me the fabrics and I could make the quilt for her as a gift. She jumped on that like flies on a cow pie...HA!!! I got the fabrics yesterday and loved them so much I just couldn't help myself. No berry picking today.....It is getting things done today day....I must. I will have to go to an institution if I don't clear some of these piles out of the way. Have a fabulous Memorial Day Week-end. Thanks to all of you who have had husbands, brothers, sisters, mothers, or even yourself for serving to keep our Country Free. Labels: Inchworm Fabrics, Young women's fabric panel and coordinating fabrics. DEW BERRY, BLACK BERRY, TOMATO TAMATO, PECAN, PACAN?? A lot of you asked what a dew berry was. It is the same as a blackberry, except they come out earlier, run along the ground, and are sweeter. I thought the dew berries were bigger than blackberries but google says that black berries are bigger and you know it is true if it is on the internet....HA!!! Most of you know that we are doing a family block a month, we draw a name each month and that person's whos name has been drawn gets to chose the block and then gets all of the blocks at the end of the month. We have eleven participating, we sure could have used twelve. I am not that great of a piecer and this is allowing me to hopefully, become better. This block is Star Light Quilt block and you can find it here, it was a quilt a long from Happy Quilting (Cut, Sew, Quilt, repeat). Chosen by one of my nieces. PLEASE SAVE ME FROM MYSELF!!!! This is six gallons of dew berries. I had eight but I have made two cobblers since, one for us and one for a baby shower. There is more to pick. Lots more. You ask why do I need Saving? So Sat. I am hobbling alone, back aching, foot aching but I am still picking berries 3 hours later. here he comes rolling along in his truck. He is shaking his head going....Barb....I thought for sure something happened to you. I am telling you I do too, I won't rest until they are all picked. In fact, as soon as I finish writing this I am off....it if finally light outside. HA!!! That is what I have been waiting for...the Light of Day. Now if I am out there too long, won't someone come and save me from myself???? I love the tornado implications of the design. Especially as we had 15 or 17 strike just west and north of us in Nebraska. This would make a great benefit quilt for one of the small towns that were extensively damaged/nearly destroyed. OH NO....SOMEONE HAS STOLEN MY PATTERN DESIGN!!! I know that a lot of them are ligit, sad to say but.............I am just showing the flip coin......I know...I know...there are people out there that will steal a design and say it is theirs....not good....stealing...no fun for the actual designer but...today I am not talking about that. Do you think it is possible for two people to have the same idea a the same time or purt near close the same time? I had a design swirling around in my head for months....and months. I scribbled down a few ideas (sorry...did some during church). It takes a while to formulate the design but I finally had the idea formulated but just slow in finding the time to make it. It was a round snowman table topper. I am on facebook and there was my round snowman topper. Oh my gosh. someone came right into my brain and made my snow man topper...almost identical to the way I was going to do it. How can this happen? I went to my husband...."Someone stole my idea from my brain"!!! I went to my children (the ones that would listen or pretend to listen). "someone stole my idea right out of my brain!!"""" I said.... I was so frustrated. What is the lesson to be learned???? Sometimes the turtle does not win the race. I recently had an idea to make a cute little umbrella runner. SOMEONE STOLE MY IDEA RIGHT OUT OF MY BRAIN!!!!!! Was it while I was sleeping? Playing my mindless facebook game (I do that sometimes while I am thinking).... did they see my sketches? Crazy huh? Two people having the same thoughts. The snowman was almost identical to the one I was going to do the only difference is someone got there first and it wasn't me. I remember thinking I came up with the best idea, posted it on my blog and someone says..."That wasn't your idea"....I am thinking WHATTTTTT....I did think of it...unique to me. Oh well...what do you think? You think someone thinks like you and possibly could come up with something you thought of. Buyers rights when they buy a pattern!! I was thinking about patterns. Once I purchased this frog pattern and I contacted the owner of the pattern to see if I could make these frogs and sell them. He told me I could only sell two. I thought, I purchased the pattern, I should be able to make and sell as many as I want. Needles to say I only made one and gave the pattern away. That is how I feel about my patterns. Anyone can make and sell as many items as they want as long as they are not selling the pattern its self. Or photo copying and giving the patterns away. Anything else Free game. Why should'nt it be? You buy the pattern it is yours. Just in case, maybe you need to contact the seller of a pattern that you want to make and sell....before you do. finally put the finished touches on this quilt. For those of you that have been reading my blog awhile, you have heard me talk of my amazing sisters. then my younger sister Beverly of Quilters Corner. 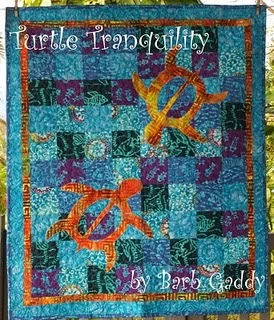 Each sister has their own nitch in the quilting world. As you see, Jeanette has her own store, Margaret has her own longarm quilting and embroidery business, and Beverly just recently got a longarm. My mother is just as amazing, she is the long time quilter, she use to tailor clothes and make all of us girls clothes for school. Happy Mother's Day to all of my sisters and mother!!! Jeanette just recently wrote up the pattern for this quilt "Oklahoma Twister"...what a fitting name. Jeanette is giving away a pattern on her blog and I am giving away one here. If you don't want to wait that long you can go to her store. Which brings me to the winner of my four fat quarters from Island Batik. Thanks to all of you who came by and commented. If I did not answer you it was because your comment did not make it to my hot mail...some did, some didn't...go figure!!! I HOPE YOU ALL HAVE A WONDERFUL MOTHER'S DAY!!!! I have been dying to do something with this ugly table above.....too lazy to refinish it...so this is what I have come up with. I chose yellow to go with the walls in the living room....when you come into our house you can see the dining room through the living room and I think...well....I think I love it!!! HOME ALONE-------LET'S SEE WHAT TROUBLE WE CAN GET INTO TODAY! Hummmmm what ever shall I do?? can't get into too much trouble with a banged up foot. Are you ready for what I have in store? This is my oldest sons's doings. He says...no worries mom, it can be fixed real easy. I don't see him fixing it real easy? It is an embarassement. I have done this when company comes over... (talk about UGLY)!!! What about this one below? Hummmmm jury is out on this one. I have seen many home shows that stage a home and the first thing they do is put a table cloth on the table....to me it closes the room off.... I guess I am just a person who likes wood and space. So shoot me now for my opinion.....it isn't worth much. So stick with me today....I am going to come back and show you an idea that has been swirling around in my head and if it works out...yepeeee...and if not....no harm done...so if you have a round table and want to dress it up...stay tuned. Can I just tell you how much I love these fabrics!!! Today I am giving away 4 fat quarters...trust me I was squealing like a stuck pig when I was cutting these up. It is so hard to give these lovelies away but just leave a comment and tell me why you love batiks. "Fruit Punch" and "Uncle Sam's Soda" by Island Batiks. Just need your address Heidi...congrats and thanks to all of you who entered. So you all have seen this fabric several times on my blog....it is called Raindrops and you can find it here on Island Batik. Island Batik does not sell the fabrics but they have a product locator for you if you want to find the nearest fabric to you. Here is an old project that I finished. I used the Accuquilt Go cutter for this project. Some embroidery fun!! Designs by Juju. I just love their designs and they stand by them. I recently purchase a design from a different place and it messed up in the middle. Iit started sewing one shape where another shape already had been. I tried it twice. What a mess and waste of time. Then I recently purchased a design from yet another place but mistakenly got the wrong format....I contacted the company and have yet to get a response. Designs by Juju will contact you almost immediately and will help you with your needs. Like I had mentioned before, batiks do not fray, they are so easy to work with because they do not stretch like some fabrics. I just love them. 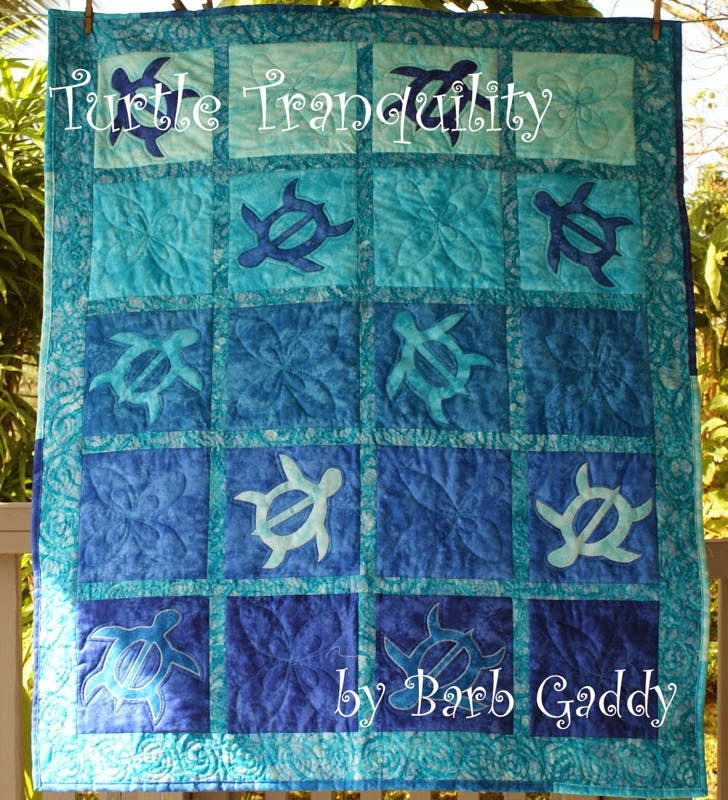 Labels: Island Batik fabrics, Raindrops, Turtle Tranquilty patterns. Accuquilt Go Clam shell runner. Embroidery Alphabet fonts from Designs by Juju.